Pigeon Street - Do You Remember? Hello, goodbye, hello, goodbye every day. Pigeons beat their wings, wings beat. I agree it’s not so catchy, but it does let you know exactly what you are going to be seeing. Her theme song summed up what a tough woman she was: ‘Long Distance Clara drives a juggernaut, way down the motorway to the busy port. Long distance Clara, nothing’s too far away. Picking up and dropping off, load after load. Long Distance Clara, shifts the gears; Long Distance Clara, she safely steers. Long Distance Clara, slams on the brakes; Long Distance Clara, accelerates. Long Distance Clara driving round the bend. Hot dinner waiting at her journey’s end. Long Distance Clara, driving down the road…always on time and never late. Whilst it was never made entirely clear which city Pigeon Street was meant to be in, I always liked the fact that somebody from that area of the UK wanted a package delivered to the Sahara. And as the song says, what’s the one thing that a long distance trucker needs when they get home after a long drive to northern Africa? (Apart from a shower of course, sand gets everywhere.) A hot meal of course. Which was lucky, because her husband Hugo was a cook. Whilst Clara was obviously the most ground-breaking figure, there were plenty of other interesting characters to observe. Bob – who was the proprietor of Bob’s Bikes – happily sported a beard without a moustache (not everybody can carry that look off) and reminds me now of Charlie Higson’s Fast Show character Bob ‘Coughing’ Fleming. Bob (not Fleming) had a cosy (if slightly strange) living arrangement with his brother Reg - who worked in the park - and Reg’s wife Doreen, a ballroom dancer. Bob had more of a link to the name of his road than many of the others, as he actually owned and raced pigeons. The people who lived in Pigeon Street generally had a fairly commonplace occupation (William the window cleaner, Dr Glossop the doctor, Mr Macadoo the pet shop owner etc.) but there were two men whose everyday existence was slightly more interesting. Mr Jupiter was a bald, heavily bearded astronomer who always carried a telescope, and slept on a park bench in order to study the stars. He also had a dog called Flash; a fast pooch that looked like a scrubbing brush. Actually, reading that description back it’s far more likely that he was simply a homeless man who happened across a telescope in a skip, and used it to pretend he was sleeping out in the open on purpose. Although given that this is a children’s programme that’s probably not the case. The other interesting man on the street was Mr Baskerville the detective. He lived on the 13th floor of Skyrise Court Flats, and spent his days wandering the surrounding areas with his magnifying glass and large, wrinkly brown dog Watson. He was more of a ‘finding things’ kind of guy than a ‘I’ll track down the lowlife who killed your brother’ type of detective, but I’m sure he and Watson would have shaped up if ever Pigeon Street became that kind of neighbourhood. The contrast between the two gentlemen (one who spent his days looking up, and the other who gave the majority of his time to looking at the floor for clues) gave rise to their theme tune, High and Low. Making up the numbers were the Glossop family; Dr, Mrs and the three children, Gerald, Molly and Polly. The parents wore huge, comedy flying-goggle glasses, Gerald was the saxophone playing older brother, whilst Molly and Polly were identical twins, distinguishable only through the large ‘M’ and ‘P’ that they wore on their rigidly triangular tank tops. Elderly ladies Daisy and Rose lived next door to each other, and had opposing views to the feathered friends that occupied their windowsills. Daisy would feed them, and encourage them to stay, while Rose would frighten them off whenever they landed. Not much is remembered about Mrs Patel, but she did make a stonkingly hot curry, which cured her neighbours’ colds whenever they occurred. The pet shop owner was, as you would expect, an expert on animals, but the most amusing thing about him were the rhymes that cropped up in his theme tune; variously rhyming Macadoo with knackadoo, quackadoo and lackadoo. I’ll leave you to try and guess what each one was referring to. And finally the pigeons themselves. There can’t be many people who, when given the choice of which bird to include in a kids’ animation, would pick the scrawny, manky-feathered, germ-ridden city inhabitant, but here they were drawn as if a representative from a pushy pigeon PR company had been sat next to the artist as he put pen to paper. Brightly coloured, plump and smiley – these birds were actually cute enough that you might want one as a plush toy – probably the only time in history they’ve had such good press. 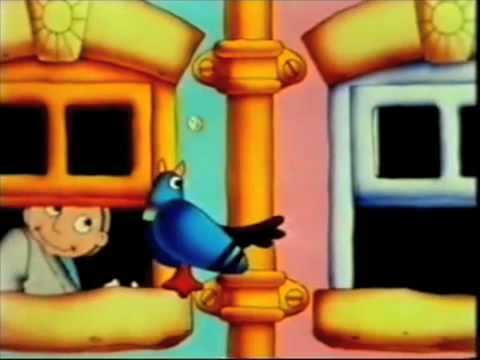 Pigeon Street was written by Michael Cole, and innovatively animated by Alan Rogers and Peter Lang, who then went on to create The Cut Out Animation Co. 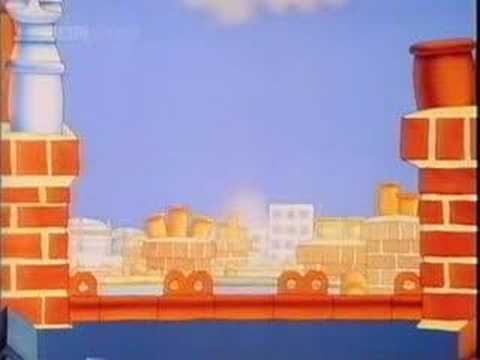 They also did the animation for another, similar programme called Rub-a-Dub, as well as Words and Pictures and Rosie and Jim, amongst others. Pigeon Street was voiced by the smooth and instantly recognisable tones of George Layton, who would probably prefer to be remembered for his acting in Doctor in the House, Doctor at Large or Minder, or for writing the classy Nigel Havers sitcom Don’t Wait Up; for me, however, he’ll always be the voice of Sydney from the Tetley Tea commercials to me. Despite it feeling more, only 13 episodes of this children’s classic were ever made. The first series consisted of eight 15 minute programmes, originally broadcast during the See-Saw slot on BBC1 from February 10th to March 31st 1981. The final five went out from November 19th to December 17th of the same year. They were repeated occasionally over the years but not enough to really justify how well everybody seems to remember them. What made the show stick in people’s memories was that perfect mix of colours, music, fun characters and interesting stories. And loveable pigeons of course. Coo. Do You Remember Pigeon Street? This was another of my favourite shows as a kid....great characters...loved the two old ladies who lived next door to each other, Rose (who didn't like pigeons!) and Daisy, Mr Jupiter and Mrs Patel! Whenever I have moved house I have always driven the van and been "Long Distance Clara" (da-do-do-do-da-do-do-do-do-do-do). Ace stuff. If you live(doo doo), in pigeon street (doo doo), here are the people you will meet, Here are the people that'l say hello.... CLASSIC!!! LOVE IT!